The effect of diet on behaviour has been studied in many species – including humans and rats – but little work has been done to explore the link between diet and the normal behaviour of horses. This is quite surprising given how influential behaviour is on competition success and the desirability and value of leisure horses. No-one wants a spooky skittish ride, whether it’s for dressage or a hack on the common. Despite evidence of strong links between nutrition and behaviour in humans, we cannot assume the same applies to horses. However, although the digestive system of the horse is very different from the human’s, the concept of Glycaemic Index still applies and it is important to understand this to appreciate how diet may affect behaviour. Glycaemic Index (GI) refers to the effects of food on blood glucose (blood sugar) levels. Foods that cause a large rise in blood glucose are considered to have a high GI or glycaemic response. High-fibre feedstuffs result in a low glycaemic response. Interestingly, research has shown that adding low-sugar fibres, such as alfalfa, to cereals, which are high GI, reduces glycaemic response compared with feeding cereals alone. Feeding meals of high-starch feedstuffs can cause peaks and troughs in energy, which may influence the normal behaviour of horses. After a high-starch meal, blood glucose levels peak 1.5-2 hours later, which might cause increased reactivity and unpredictable behaviour. Feedstuffs that have a low glycaemic response, such as sugar beet pulp and alfalfa, provide more consistent energy levels than feeds with a high GI. A horse who is more reactive and difficult to handle is likely to be harder to train and increases the risk of harm to riders, handlers and the horse itself. It’s also not much fun riding a horse who is spooky and unpredictable and it’s particularly frustrating if tense behaviour mars performance. Eight mature horses were used, including a selection of Warmbloods, cobs and an Appaloosa, from 14.2hh to 16.1hh. All were maintained in light work for the duration of the study, including jumping and flatwork five days a week. At weekends, the horses were turned out for four to six hours a day. The study took place from January to March, when grazing was very sparse. Two different diets, both containing exactly the same amount of energy and based on haylage, were fed. One diet included Dengie Alfa-A Molasses Free, with a starch level of 2%, and the other contained a traditional, cereal-based concentrate mix, with a starch level of 22% – a fairly typical level for a medium-energy mix. The high-starch diet provided 0.7g of starch/kg of body weight (BWT) per meal, whereas the high-fibre diet supplied 0.3g/kg BWT for the same amount of energy – both well within the levels recommended to avoid digestive problems. The horses were divided into two groups and fed each of the two different diets for 28 days in a crossover study. 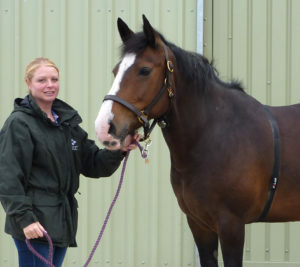 Louise Bulmer measured the horses’ behaviour to see how reactive they were to new situations and equipment. She also measured horses’ heart rates as an indication of stress levels during the tests. They were carried out in early morning with few other disturbances, within a few hours of feeding, when glycaemic response should be at its peak. The novel stimuli test was carried out in a section of an indoor school. 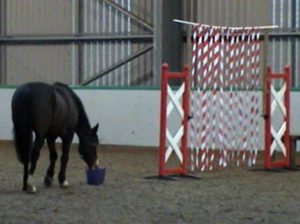 The horse was first familiarised with being released, and free to approach and eat from a feed bowl. Once the study was started, white noise was introduced to one metre behind the feed bowl – a well established test of reactivity. The time taken for the horse to approach and eat from the feed bowl was recorded. A handling test was also carried out where the horse was led to a curtain of red and white strips of plastic, and verbally encouraged to go through – no pulling or force was used. Again, the time taken to pass through the curtain was recorded, along with the behaviour of the horse. 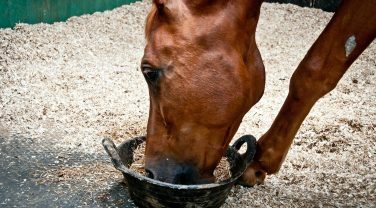 The study showed that horses fed a cereal-based concentrate mix were overall more reactive to new situations and equipment. They were less consistent in their behaviour and had higher heart rates compared with horses fed the fibre-based supplementary feedstuff. 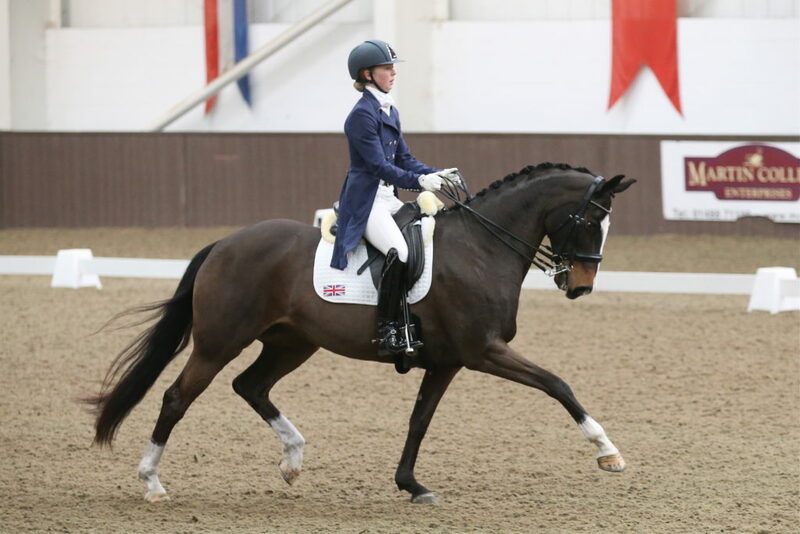 “This suggests that, while high-starch diets are considered to be an effective energy source for humans undertaking increased exercise, they are not necessarily ideal for providing the energy for working horses,” explains Louise. The results of Louise’s study concur with the results of one other previous study that looked at the effects of diet on a horse’s behaviour. It was carried out on horses with Recurrent Exertional Rhabdomyolysis, the muscle problem previously known as Azoturia or Tying-up. Here, the researchers found that horses fed a high-starch diet became more reactive, demonstrating increased nervousness and excitability compared with when they were fed a diet low in concentrates and high in fibre. So, although the benefits of high-fibre diets to digestive health are increasingly appreciated, it appears that there is growing evidence that they may also help to create calmer, more manageable horses. 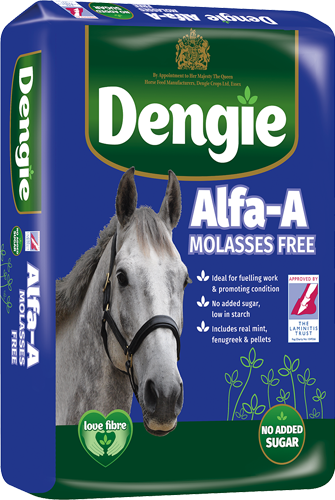 Dengie has a wide range of horse feed products that are molasses-free. This quick guide will help you choose which one is right for your horse or pony.